One of the most interesting joint processes we went through was the creation of the cover for Rawhide 'n Roses. Although we all had a finger in the pie (which can't have made the job easier) Charlene Raddon was the creator of the cover art. Charlene began writing over thirty years ago following a dream that spurred her to dig out a typewriter and start writing. She’s been at it ever since, driven by a love of the old west and romance. Her books have received high praise in reviews and won several contests. Her first book became a Golden Heart Finalist, and another of her works received a Romantic Times Reviewer’s Choice Award Nomination. She also writes as Jennetta Dodge. Charlene designed a few of her eBook covers and now designs them to be sold on the Stilettos At High Noon blog. The cover art and title of the anthology go hand in hand. How did the one process affect the other? You can design a book cover without knowing what title it will be given when published. I’ve created almost fifty for Stilettos At High Noon. But when the title is known, it is the driving force in designing a book’s cover. 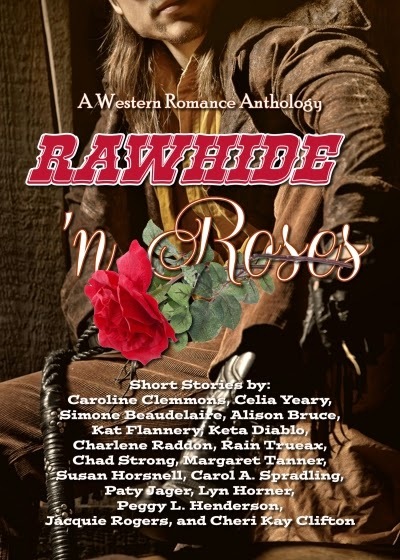 Since the stories in Rawhide 'n Roses were to have a western and/or romantic theme, (and because all but one of the authors are female) I searched for a cowboy type hunk for the cover. Threading a rose through the letters of the title added to the fun and the challenge. 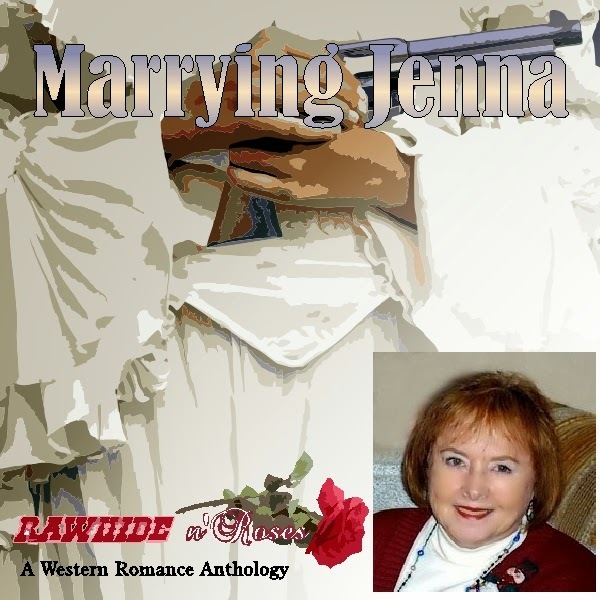 My contribution to the anthology, Marrying Jenna, is a sequel to my full length novel, Taming Jenna. 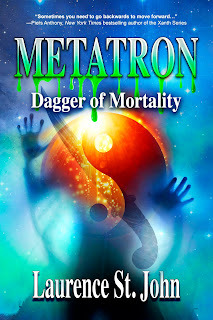 In the book the heroine, Jenna, leads the hero on a merry chase. Both are after the same outlaw, but Jenna finds a way to catch him first, taking him right out from the hero’s nose. And so the chase begins. But by the end, Branch McCauley manages finally to convince Jenna to surrender her heart to him. The short story is about their wedding day, which, typical for Jenna and Branch, ends up anything but typical. The biggest hurdle I ran into once I was published was the realization that signing that first contract is only the beginning. For years, a writer slaves away trying to write a good enough book to sell. It’s a long battle with many scars. After a while, all you can see is that one goal—becoming published. It feels like a victory, and it is, of course, but then you discover that the battle has just begun. Now, you have to keep selling, and that can be more difficult than making that first sale. You learn exactly how fierce the competition is, and that, if you don’t make it big, I mean really big, right away, then you find yourself in the ignominious position of the mid-list writer. In many ways, an unpublished author has a better chance of selling a book than a mid-list author. It’s like having your leg go through the ladder, between the rungs, and being stuck there, unable to go up, or down. My latest release was the book I was talking about earlier, Taming Jenna. Not only was it my recently published eBook, but it has just recently been released in print, as well. Designing the cover for it felt particularly rewarding because the cover Kensington created for the paperback was awful. The hero looked like a vampire about to bite the heroine’s neck. Such a cover used to be called “the clinch”. Now, clinch covers can be very nice when well done, but this one sucked, excuse the pun. Thanks so much for all your patience and hard work--the cover is beautiful and your story is great! You did a great job on the cover, Charlene and I love your story. Thank you, Jacquie and Susan. Despite the hitch of trying to satisfy 15 people, I truly enjoyed making the cover. And thank you, Susan, for all your hard work putting the book together. I know that had to be far more difficult than what I experienced. Your patience amazed me. Alison, thank you for having me here today. I enjoyed the interview. Thank you for getting this to me so quickly. I wanted our cover designer up on our launch weekend along with our wrangler and book trailer designer. Stellar writer, is Charlene :-) Great interview! Bravo to you for creating your own cover! Authors tend to be a multi-talented bunch... mostly because we have to keep our day jobs. Charlene's day job used to be design.